Microsoft Edge is the default browser for Windows 10, but if you run apps that need ActiveX, you should use Internet Explorer 11 instead. Internet Explorer 11 used to come with Windows 10 systems, but if you don't have it, you can download it from Microsoft. This tutorial is only intended for users running the IE11 Web browser on Windows operating systems. The goal of ActiveX technology is to simplify playback of rich media including videos, animations, and other file types. Because of this, you'll find ActiveX controls embedded into some of your favorite websites. The downside of ActiveX is that it is not the safest technology around. These inherent security risks are the main reason for IE11's ActiveX Filtering feature, which offers the ability to allow ActiveX controls to run on only the sites that you trust. To use ActiveX Filtering to your advantage, open your Internet Explorer 11 browser. Click on the Gear icon, located in the upper right corner of your browser window. When the drop-down menu appears, hover your mouse cursor over the Safety option. When the sub-menu appears, locate the option labeled ActiveX Filtering. If there is a checkmark next to the name, then ActiveX Filtering is already enabled. If not, click on the option to enable it. 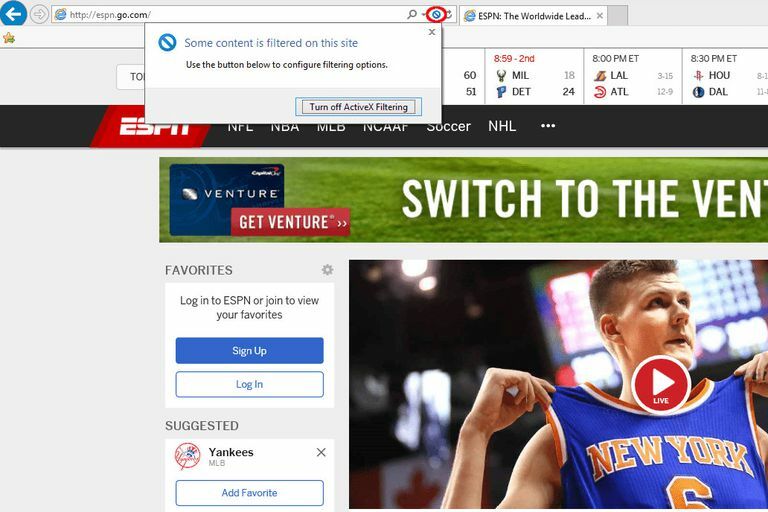 The image that accompanies this article displays ESPN.com in the browser. As you can see, there is a new blue icon displayed in the address bar. Hovering over this icon displays the following message: "Some content is blocked to help protect your privacy." If you click on the blue icon, you are given the ability to disable ActiveX Filtering on this particular site. To do so, click on the Turn off ActiveX Filtering button. At this point, the Web page reloads.